I like routine. And the Hucke holiday, with all of its wonderful-ness and awful-ness and everything in between, was anything but routine! With Becca settled in Madrid, Spain for the semester, Doug back to work and Ian registered for another 6 credits that begin soon, I’m relishing a return to some routine. Christmas is put away, the returns are returned and the gym is calling. Today, at least as far as I can see, feels routine. And that feels good. Just before Christmas I had an especially outrageous and vivid dream. Ian was in the passenger seat of a car that his new service dog was driving. The pair were driving through the Trader Joes parking lot very slowly for maximum shock value. Mesmerized onlookers began to assemble. Ian’s grin was enormous and directed at me as he rode past. Shocked but calm, I waved. And then in slo-mo, the dog drove right towards the plate glass window. After a spectacular crash, the car stopped in the entry taking down the garland display. I walked close enough to see that both Ian and the dog were not hurt. They weren’t. In fact, Ian was laughing and they were both adorned with greenery. As preposterous as the dream was it’s ending seems especially curious. The moment I realized that Ian was not hurt, I bolted. Quickly left. As in escaped. The dream seems understandable given Ian’s relentless push for independence. But my speedy departure from the scene of the crime has me scratching my head. This ongoing recovery, this new normal, this uncertainty of Ian’s future requires daily endurance. And I’m tired. It isn’t the routine stuff that is so wearing. Cooking, cleaning, making arrangements, answering questions, driving to appointments… that’s just fine. It’s the unpredictable drama. It’s the driving with a dog into a storefront kind of thing that has me dreaming of escape. It’s the stuff you can’t anticipate. It’s the stuff that happens at the worst times. It’s the stuff that disrupts everything and everyone including Christmas Day. I remember when I was pregnant with Ian I was determined to figure out motherhood. I was an older mom (34) and had mastered the work place. Felt competent even. Motherhood though seemed daunting and anything but natural. I devoured the entire book “What to Expect when You’re Expecting” with little increase in confidence. Is it just me or were there a few chapters missing? I would stress about getting everything just right. Ian used sterilized pacifiers, ate homemade baby food and was on a strict sleep schedule. By the time Becca was born a year and a half later, I would pick her pacifier up from the dirty floor and wipe it on my pant leg. What changed. I did. On the job training. In hindsight, I wonder if the book really helped? The point is, my quest to get it right had little to do with the instruction manual. It had everything to do with being prayerful, flexible, intuitive and walking with God through it. There is no book on what to expect with a Traumatic Brain Injury. I know this because on one of my sleepless nights, I googled it. Go ahead, I dare you. It was completely useless! It only served to feed my frenzied, unsettled feeling. Not surprisingly, the day came… I cracked under the weight of it all. Without thoughtful intention, I simply quit. I ignored everything. The incorrect bills collected in a stack, the phone calls didn’t get made, the research didn’t get done and life went on. Honestly I don’t think anyone noticed. Except me. I felt awful. With more time on his hands compounded by a long break from UNM, Ian’s mood was volatile, making it easy for me to ignore him completely. Looking back I’ve learned that my ‘cracked-state’ may have been caregiver burnout, or compassion fatigue. According to Web MD, they are real syndromes and you don’t want them. Thankfully my listless, apathetic behavior got my attention quickly and I turned to fervent prayer. God nudged me to ask for help. I resisted. I mean… I have the time, I understand what is needed. I just don’t want to do it. Losing interest didn’t seem like a reasonable excuse to request help. Besides God… who, what and how do I proceed? The thought of help hung over me for days but I didn’t really know what to do with it. Then a person came to mind, Betsy. She’s a retired nurse and had reached out before. I prayed about approaching her not quite sure what to ask for, but sensing I should try. And then I did it. I called her and asked for help. It was so easy. I spoke about my struggles and how incapacitated I felt. I didn’t know how she could help, but I welcomed it. Hanging up I felt a sense of relief but with little expectation that much would change. At least I was obedient I reasoned. God got my attention and I listened. I’m not expected to do it all. In fact, not only will I crack under the burden, it is not His design. Galatians 6:2 Carry each other’s burdens, and in this way you will fulfill the law of Christ. I’m sure Betsy would minimize her efforts as no big deal. In fact to me it seemed as if… wait for it…. she enjoyed it! Betsy was obedient, I was obedient and the result was a WIN WIN. The day we spoke she sent me an email with a simple to do list. It was as if she saw my enormous elephant and spoon fed me in bite sized chunks. Thank you Betsy. Betsy called on her connected friends for direction and Ian was moved to the front of the line. Yesterday after a lengthy interview and lots of paperwork, the letter came that Ian has been approved for 15 caregiving hours weekly. HUGE! And a month ago I had no idea this was even a possibility. While preparing for 5 months abroad, I watched my independent daughter struggle with the same thing I struggle with. Self sufficiency. I am so proud of her. And she will soar in Spain. But both Doug and I were eager to help her to prepare. And she resisted, refused even. How is it that we see our own frailties most prominently when they are displayed in someone else? I’m convicted. While road-tripping to Denver with Becca, I had lots of time to reflect on the subject. My prayer is to let God be God and get rid of self-sufficiency. He is showing me that in my efforts to be excellent at life, I try to tame God. Without intention I try to manage God, to reduce Him, to confine Him, to bring Him down to my level. Instead He wants me to acknowledge Him in all His glory, majesty, and power. When we say we have everything we need, but Jesus isn’t our first priority, He is deeply offended. 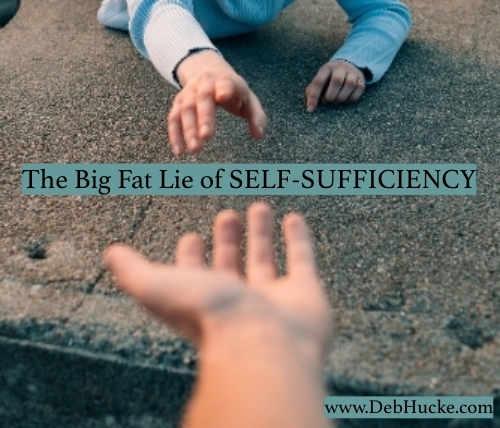 Self-sufficiency distracts us from realizing what we need most, that only He can provide. From my observation of people, the most self sufficient ones are often the farthest from Christ. After all, they have no need….. YET! That is why tough circumstances are such an effective faith building tool. Circumstances cause self sufficiency to crack. Have you ever stopped to consider how much we do according to our own plans and in our own strength? Far too often, we act first, and expect God to bless our efforts. God did not create us to be self-sufficient. He created us to need each other. If you’ve got the disease of self-sufficiency, you’ve probably had it a long time. And you’ve probably been complimented for it. Perhaps you’ve spun it in positive terms like responsible, independent, and reliable. Indeed, self-sufficiency has lots of advantages. For starters, you get to avoid appearing needy and weak . And in time, you start to believe your own press. If you’re going through something and you choose to handle it and not tell anyone. If you prefer to isolate yourself and put on your ‘I’m OK’ mask in public. If you answered yes to one or more of the symptoms, may I suggest some medicine? A large dose of consistent prayer, asking God to shine His light on your self sufficiency. Next, confess to a close friend or family member. Don’t carry it alone. When I cracked, that was the medicine God prescribed to me. Making that phone call to Betsy may seem insignificant, but it wasn’t. I confessed. I admitted my desperate neediness. Confession is telling the truth, and the truth is, we need others. If you feel burdened by this truth, and need more direction, please reach out. I always appreciate your public comments. But if you’d rather ask for prayer or direction privately, I welcome that too. Allow God to melt the cold, hard ice of your self-sufficiency. Life is sweeter when you do. Asking for help is so much harder than giving. When I was ill I remember reaching the stage when both of us were exhausted. Housework was the lowest priority. Then friends asked how could they help and appeared for a weekend of housework, which I missed due to a hospital admission. Asking for lifts from neighbours was hard yet they didn’t mind, even as we had to sing the wheels on the bus the whole journey as her 1 year old hated the car. Lunch brought in when I couldn’t face even making a sandwich. Realising that life is all the richer for having community round about me. Amen! I know on my end, from across the pond, it was so hard because I couldn’t physically help. Giving/Receiving is a two way street. Miss you Mags! I appreciate your post and am thinking about how I habitually insulate myself from needing other people. For sure, it’s some self-protection that has served me well in the past but I know that it still keeps me from reaching out to others or to God. So, I do have a small group and a professional women’s group right now where we practice asking for help from each other and God with personal and career related issues. I sometime even ask for help! I passed your post along to my friends in both of these groups and thanked them for their wisdom and care. Remember the great line from Jerry McGuire “Help me, help you. Help me, help you.” That’s basically what these friends do for me!! I’ve always admired your competency, Debbie but also so glad that you could reach out for support when you have such a heavy load. Kaye, Thank you for your comment. Love that Jerry McGuire reminder. Indeed… help me, help you! Admired competency… ouch. I know that’s a compliment, but it is my struggle wanting others to think that. Glad you can identify a wee bit, my competent friend. Thanks for your recent hospitality! So glad to be in touch again. I am reminded of my mom who, when going through a difficult and long health concern, felt terrible that she had to ask her elderly parents to help her around the house. They were able to do it and loved it! Someone said to my mom, “When you do not ask someone to help, you are depriving them of their opportunity to serve you.” As Christians, we love to serve others, but in order for that to happen, someone needs to be served. It is a hard thing to do, but as you said, it’s WIN, WIN! As always Debbie, thank you for your insight. I recently gently reminded my niece that it is not what we can do or how great we are at managing all life’s challenges, but it is God who carries us through. And it is by our Faith in Him that carries us through. It was a tough lesson I continue to learn over and over! Thanks Betsy! I’m thankful for His grace because I’m sure I’m far from mastery of this truth. It’s a journey. I appreciate you. Indeed. Just know there are people who are eager to share your burden. Here’s to no shutting down ! Thanks for sharing! I struggle in this area as well! I feel I am not good at what I do if I ask for assistance! When I finally break down and ask for help I realize I came out of the assistance a better person! You would think I’d learn! As each stage of life approaches, begins and moves on, I realize there are new milestones, goals and different anxiety! I am trying to go with the flow. Easier said than done! I seem to continually pray for guidance, protection and rest. I don’t know what i’d do without the great “I Am” to speak to during my quiet, alone time. I love reading your well thought out words that obviously help you but help me and many others as well! God bless! Great to hear from you Beth. I am so pleased that you are blessed by my writing. Keep on Keeping on. It’s a journey. And keeping Him close enables you to claim victory! “If you answered yes to one or more of the symptoms…” WOWzers!! I’m the one who sits there in silence during the “prayer request” time in any small group or class… Sure, always a prayer request immediately comes to mind, but I usually feel like it’s a small thing or others might worry about me if I voice what I’m thinking… But the times I voice it, small or big, I always feel lighter. So thank you for this wonderful reminder! We NEED others and others NEED us. Doing this thing called life together is so much better then doing it on our own. Yes! A friend shared to me privately that when we carry it alone, we rob another Christian from helping us. And their robbed from the blessing too. It is a brilliant design. Thanks for your comment. Anne, you have such a servant heart. Thank you for being a faithful blog follower and supporter. Thank you for this writing on SS and for sharing so genuinely your struggles. SS is definitely a struggle for me. Although I’ve been trying to do better with it, and invite God into my circumstances more and more, it’s still tough and takes lots of effort to ask for help–even with my own husband. I’m thankful for my women’s groups where I’ve learned to ask for prayer. I appreciate this blog so much. Thank you, Debbie. Karen, somehow I gravitate towards others with this disease. No wonder we’re friends. So pleased you appreciate my blog. Please encourage your friends to subscribe. Spot on, yet again, Debbie! I recognized the SS symptoms about a month after my mom died (after a very short battle with brain cancer). As the designated “helper” of my family, it took me a while to realize the tables had turned. Very tough to recognize and even tougher to admit. But, that’s what grace is for. Helping us see the need, acknowledge the need, and then get some help. Thanks for your insight! Thanks for sharing Bridget. And prayers for you as you adjust to a new normal with your mom relocated to her heavenly home.